Last year, Iiyama Yoshimasa (飯山嘉昌) forwarded in a brief article (Tôken-Bijutsu 677, June 2013) the theory that the famous “bird of prey catching a monkey” (môkin-hoen no zu, 猛禽捕猿図鐔) tsuba of Shimizu Jingo (志水甚吾) (picture 1) depicts actually an eagle rescuing a monkey rather than catching him. When the June magazine arrived last year, I just skimmed through the text as I was quite busy at that time and I even forgot to reply to an inquiry from a fellow enthusiast who asked me if the article is on the eagle motif in general or on Jingo´s eagle interpretation in particular. Now just a few days ago, I stumbled by chance over Itô Sanpei´s (伊藤三平) comment on Iiyama´s article in his highly interesting blog which made me curious and so I reread the article. And as it is really exciting to get a complete new view on a well-known motif, I thought I better share Iiyama´s find with my readers. 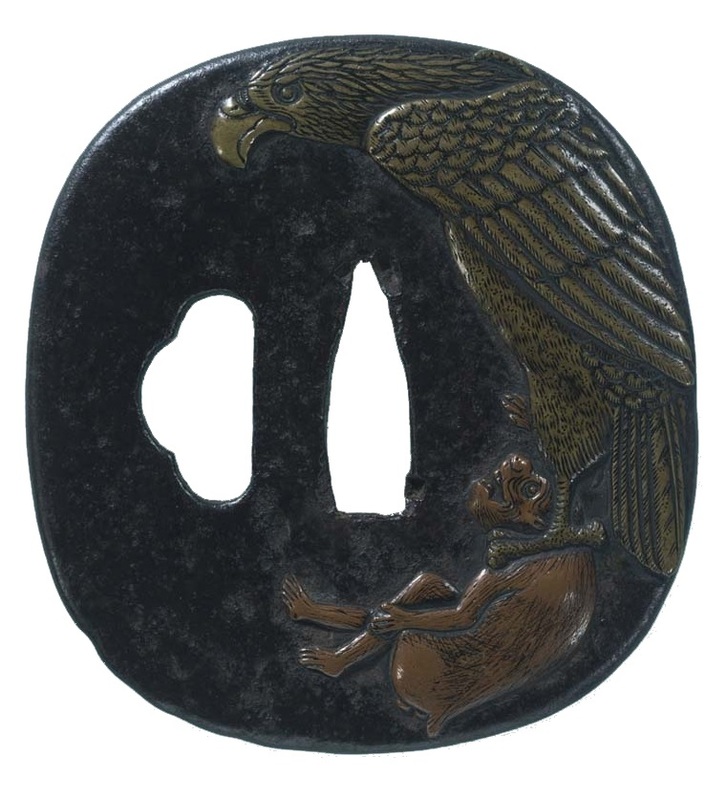 Apart from the discussion that this tsuba is actually a work of Nishigaki Kanshirô (西垣勘四郎) – the present owner, the Tôkyô National Museum labels it as work of Jingo, Itô Mitsuru (伊藤満), the author of the excellent Higo books says it’s a work of Kanshirô – all publications quote the tsuba´s motif as mentioned above, i.e. 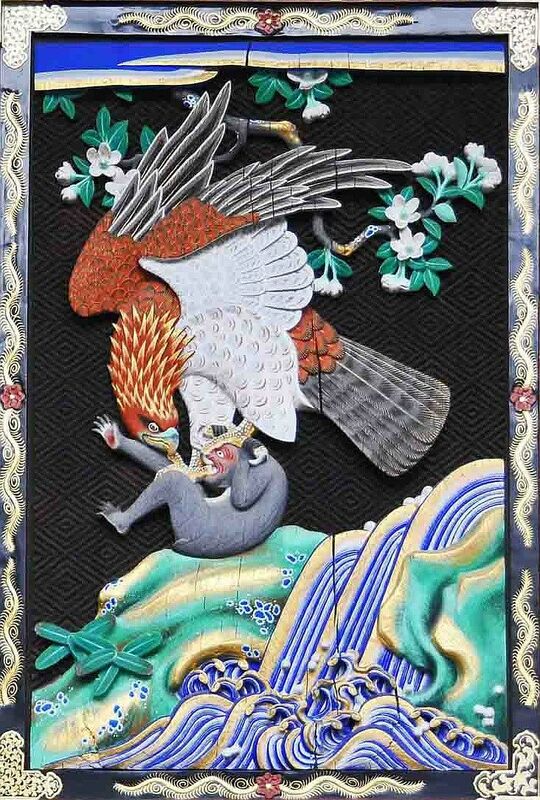 “bird of prey catching a monkey.” Iiyama now saw in an art show on TV a report on the Kangi´in´s (歓喜院) Shôtendô (聖天堂) which was designated as kokuhô in July 2012. The temple is located in Menuma (妻沼) in Kumagaya (熊谷市) in Saitama Prefecture and the Shôten Hall holds a panelling into which the motif “eagle and a monkey” (washi to saru, 鷲と猿) is carved (picture 2). The carvings are attributed to the semi-legendary early Edo-period sculptor and carpenter Hidari Jingorô (左甚五郎). Striking is the similarity of this carving to the motif of the tsuba and now things get interesting. The Shôten Hall´s carving is namely described as follows: “Motif of an eagle rescuing a monkey who fell from a tree into a raging stream … The monkey stands for the hard to control human earthly/carnal desires and the eagle for Shôten (聖天) – also called Kangiten (歓喜天), the patron saint of the temple and Shôten Hall – who rescues us from these desires.” Shôten is generally considered to be the Japanese Buddhist form of the Hindu elephant-headed god Ganesha, but is also identified with the Shôkannon-Bosatsu (聖観音菩薩), the Bodhisattva Avalokiteśvara who embodies the compassion of all Buddhas. my tsuba education enters a new phase….